I'm on a roll! Deadlines, you force me to complete things. 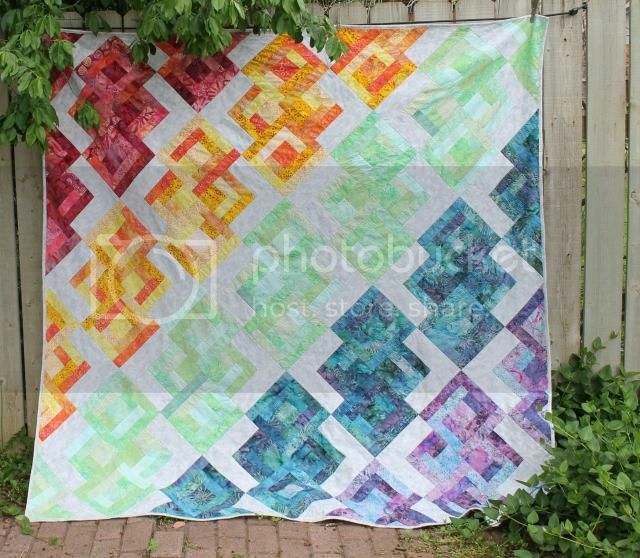 This is Rainbow Sherbet, one of my favorite quilt designs EVER. In fact, this is my second one. When my mother-in-law came to visit last September, she brought a huge stack of batiks with her. In exchange for an impressive amount of yard work, I agreed to make her a wall hanging. She browsed my books and patterns and was drawn to this one, because she has awesome taste. The quilt came together in the week that she was here, toiling in my dirt. I think there were times she doubted how it was all going to come together, but this is is definitely a Monet. Cher: It's like the painting, see? From far away, it's OK, but up close, it's a big old mess. Quilting, well... Quilting is always a conundrum. 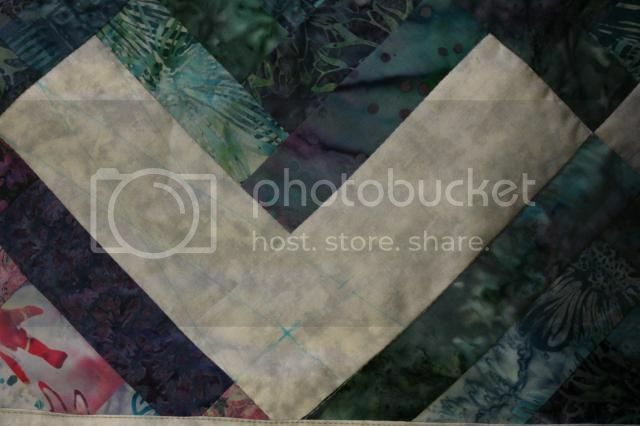 I wish I could free motion quilt, but I can't. Not for lack of practice - I just don't think in doodles and feathers and "free" things. I can't even draw stippling on paper. I considered a couple different straight line designs, but in the end, I stitched in the ditch. Yes, it's a copout, but this thing is going to be in a second story entry way. 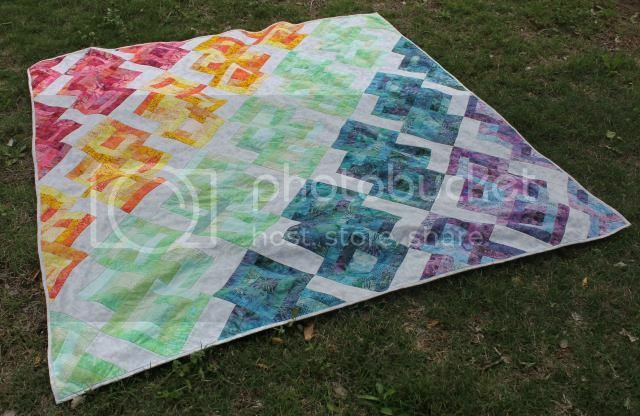 No one is going to see the lack of quilting. 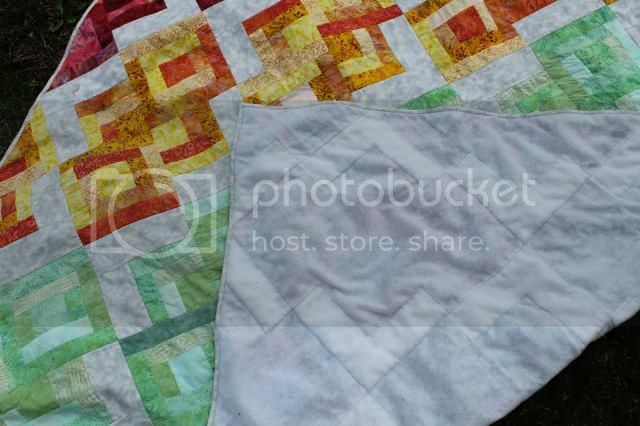 It probably should have been quilted down the middle of the colors as well - the fleece got loose after washing - but, I was going for lazy lightweight. I'm really excited that it'll be greeting everyone who walks into my MIL's house - I can't wait to see it up there! OMG, I just realized my MIL did this on purpose to get me to come visit the quilt her.